Sometimes, we need to figure out where rain drops start flowing (i.e., ridges, hilltops, or headwaters with no contributing upstream cells) from a drainage direction map (drain_dir) only. If we have a flow accumulation map (flow_accum) that was generated using a single flow direction algorithm, the following command will generate the same output because ridge cells always get assign 1 (itself) as the number of contributing cells. However, when we use a multiple flow direction algorithm, there is no guarantee that ridge cells will get assign 1 because there can be partial flows from neighbor cells. In this case, the first method may be useful. Figure 1 shows ridge cells in yellow and sub-watershed polygons in the background. Figure 1: Identified ridges. 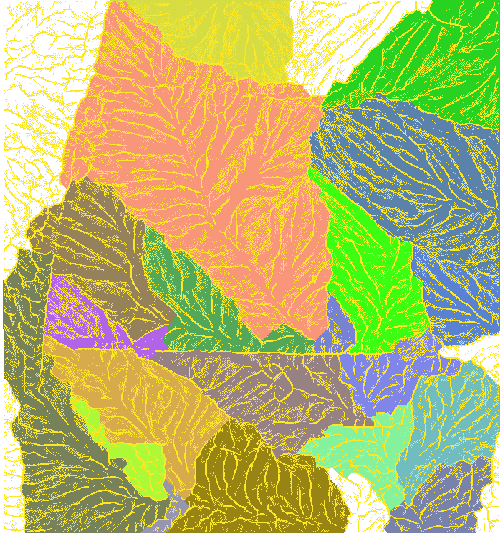 The yellow cells represent ridges and the background polygons display sub-watersheds. Figure 2 clearly shows that these ridge cells do not have any contributing upstream cells. Figure 2: Close up. 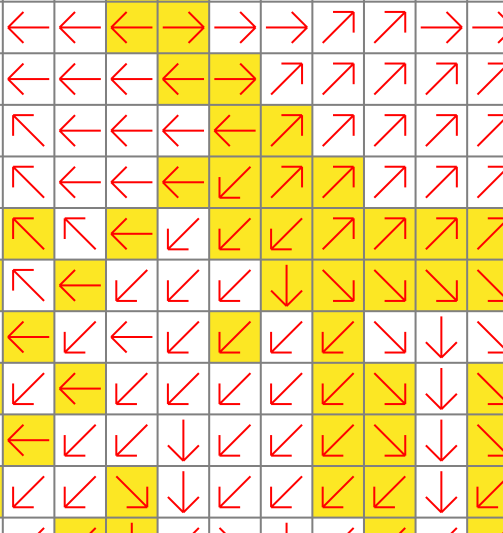 The red arrows show drain_dir directions.